When I volunteered to help students at Relay for Lay, I had this lively discussion with a fellow teacher about everything under the sun, and of course we started to talk about books. This teacher told me that he really liked the Catcher in the Rye. 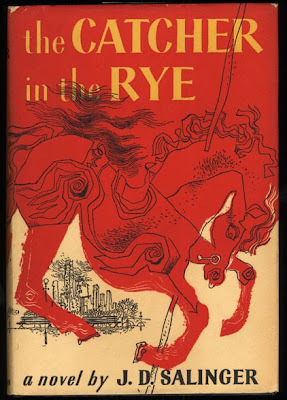 There was no way I was going to admit that I have gone to some pretty good schools and have been teaching for a LONG time, and I had never read the Catcher in the Rye. So, I smiled at him and put the Catcher in the Rye on my list of books to read. Well, I just finished reading the Catcher in the Rye, and I will not subject any student that I teach to this book.. The main character is Holden Caulfield, and he is a sixteen year old boy who is in a hospital or sanatorium. He tells this story of being kicked out of high school and not wanting to go home. The entire story is basically written in stream of consciousness, or Holden's random thoughts, that at times are very inappropriate for school age children. Some of these topics need to be discussed between parent and child and not student and teacher. Life has been happening, and I have not had much time to read so it took me quite a long time to finish the Catcher in the Rye, but maybe it took me quite a long time because this book just did not hold my interest. My next read is Annie John by Jamaica Kincaid! Ted, I totally agree... Quite an awful main character!